Truth is, I never met Robin Williams. The only encounter I had was seeing him at a sushi bar in the Richmond District of San Francisco. I vividly remember people around him laughing out loud and enjoying themselves. Maybe through his humor, through “Mork & Mindy,” “Mrs. 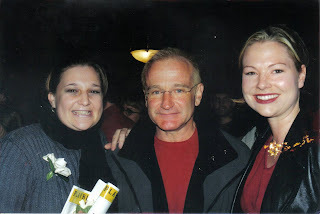 Doubtfire, “Birdcage” and other movies and interviews, I felt a deeper connection to him. It seems everyone I have spoken to since his passing had a story of when the comic genius brought light into their lives. I may not have known him personally, but I will always remember how he made me feel. I’ve been obsessed with the reports that ensued. Comments flooded my social media accounts. People recounted their memories with him. Pictures, short stories and links to articles of depression filter in. I try to think of something positive -- perhaps this is opening up a dialogue about mental illness and depression. But my heart remains heavy. "Is it weird if I ask you to take a picture with us?" she asked. "Only if you don’t have a camera," he said. Robin Williams R.I.P. Michelle Kennedy. Photo courtesy of Michelle Kennedy. Jim Norton wrote this poignant article about his encounter with Williams — how he made him feel in the crazy competitive world of comedy. It seems like there are more questions than answers. Maybe the answers won’t all be answered. It seems that Robin Williams has publicly talked about his addiction to drugs and alcohol, but didn’t talk much about his depression. It seemed he didn’t know how much people loved him. Perhaps he didn’t know how much joy he brought to people’s lives. Perhaps that wasn’t enough. It’s been a difficult month for me. My close family friend’s mother passed away from cancer, other friends of friends lost loved ones from suicide, sudden death during sleep and other accidents. Having lost four family members in about a year’s time, I know that unfortunately (and fortunately) death brings people together. It’s inspiring to have witnessed people mobilize in person and online to make donations, help family and friends cope, and set up funds for surviving children. Likewise, it's moving to see the outpouring of support, people sharing stories about Williams' warmth, charm and pizzaz. While we don’t know what happens when our spirit leaves our bodies, I know that what connects us all are the stories that people keep in their hearts. This is their legacy. What do you want your legacy to be? I invite you to share how you're healing and how you're honoring his life. 1. I wonder if Robin Williams ever knew the magnitude of the impact he had on others. Did he know and FEEL the love that loved ones, colleagues and strangers had for him? I realize I need to tell more people I love that I love them and better yet, share stories with people about how they make me feel. (Why wait till someone is gone to share?) We'd love to hear, just #GoInspireGo so we can share. 2. We as humans need to do a better job at understanding and helping those with mental illnesses. Write a check, donate your time and talents and/or share information about mental illness and depression. To start, here’s an interesting article from Time. 3. We should laugh more. Tell a joke, rent a funny movie, don’t take life too seriously. Life is too short! * Please share this blog and tag a friend, telling them a quick story about how and why they make you feel good/happy/joyful.